Range of active low relay boards with various number of channels. The boards feature either 5V or 12V relays capable of being switched on-off by an opto-isolated digital input. 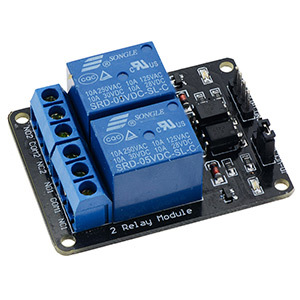 The relays are controlled by a microcontroller connected to the output pin and require a minimum 1V to switch the inputs ON. Suitable for 5V and 3.3V devices, these boards are perfect for Raspberry Pi, Arduino, PIC and various other microcontrollers.